Ladybug Music MN: Music classes for infants, toddlers & preschoolers. 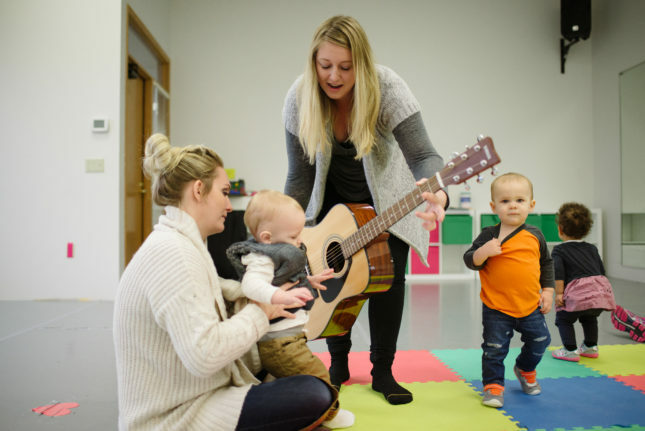 Ladybug Music offers a research-based, mixed age (infant – four years) class that exposes families to the richness of musical styles which reflect the wonderfully eclectic music of our time and culture. In a fun and informal setting we sing, play percussive instruments, dance, chant, do finger plays, listen, get very silly, sing lullabies and so much more. Together we explore sounds, words, pitch, tempo, melody, tone, meter, rhythm, dynamics, beat, movement and dance, all in a non-performance environment where every child and parent is able to experience their style of learning with no expectations – just play!